For the upcoming 2.3 release, we’ve added a new feature and made several fixes to the way we index posts for search that will make search results better. Each individual category can be configured with a search priority which you can find under the Settings tab when creating/editing a category. Five levels for prioritization have been added: ignore, very low, low, high and very high. The levels work by adding multiplying a pre-configured weight to the search ranking for each result and can be configured via hidden site settings in your console. As an example, configuring a category’s search priority to very_high will boost its search ranking by 40% while a search priority of very_low will reduce its search ranking by 40%. 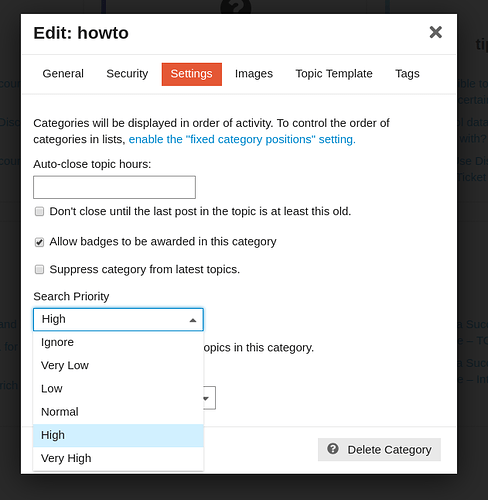 Setting a category’s search priority to ignore will remove it from the search results. However, you can still search for posts within the ignored category by scoping the search to the category via advanced search. Do take note that search priority is not inherited which means that a sub-category will still be searchable even if the parent category has been configure to be ignored. Search relevance has been updated to consider the document length in the ranking. Previously, search ranking was ranked by the most number of matches for the given search term. This was problematic for search results as we noticed that longer posts were more likely to be ranked higher because of the tendency to produce a higher number of matches. As a result, we’ve made the switch to consider the document length when ranking search results. URLs in posts were sometimes incorrectly tokenized and indexed twice leading to terms within links having a higher ranking. Content for lightboxes in posts were polluting search results with the image’s metadata. Do let us know if you’re search results have improved after these changes. We would also like to know if you think your search results have become worse so that we can continue to refine it. Thank you all! Is the age of a post part of the weight in ranking search results? Information gets stale fairly quickly in our forum, so it would be nice to have a way to reduce the relevance of older postings without actually eliminating them.